8 aug 2010: Casetta softwares are no longer actively developed (however, they are still working). If you are interested by the software, as user or as developer, please subscribe to our mailing-list, there is still people to answer you! 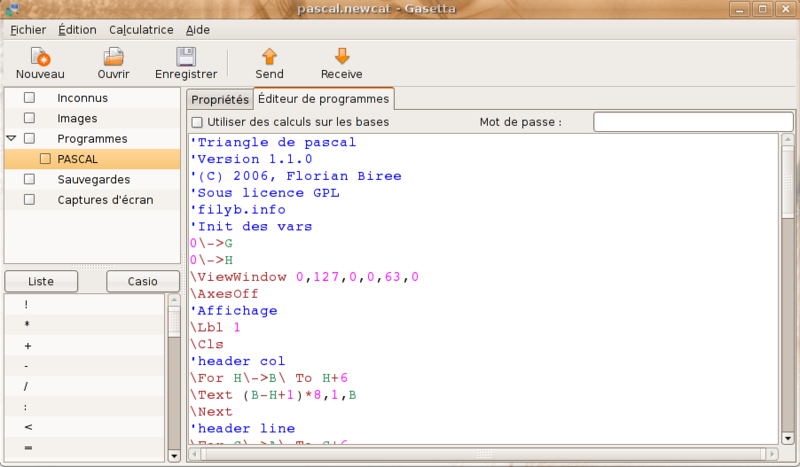 The aim of the Casetta project is to provide a collection of free (as speech) softwares to open, edit, convert and transfer data with a Casio graphical calculator under GNU/Linux and others operating systems. Casetta: a python module to make conversions between various casio data formats, transfers with a Casio calculator and let any python program manage data such as programs, backups, etc. Casetta_cli: a command line interface for Casetta, to make massive formats conversions, or just to use a powerful interface. Gasetta: a graphical interface to make file conversion, transfers and to manage and edit yours data. If you want to help us, you can also report bugs, show the Roadmap, read the how to involve or contribute to the casio format documentation.